Veteran Wang Linying's living room is filled with photos of the old days. 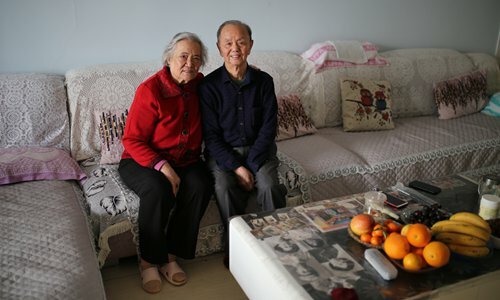 This 82-year-old lady and her husband, 88, live in a 120-square-meter 18th floor apartment in central Urumqi, capital city of Northwest China's Xinjiang Uyghur Autonomous Region. The room is decked with black and white portraits of her when she was young. At that time, she had two ponytails and a shy smile. In some pictures, she wears a military coat. In 1952, Wang joined the People's Liberation Army (PLA) in Xinjiang after traveling thousands of miles from her hometown in East China's Shandong Province. Working as a nurse in the military, she devoted most of her life to Xinjiang. Like Wang Linying, in 1952, more than 20,000 women from the coastal province in eastern China flocked to Xinjiang for the construction of the region. It took a decade to see major changes taking place in Xinjiang. In September 1949, Xinjiang was peacefully liberated. In February 1952, Chairman Mao Zedong gave the PLA troops the order to build Xinjiang while defending its borders. The Xinjiang Production and Construction Corps (XPCC), a quasi-military, governmental organization, was founded in 1954. At that time, the 170,000-strong army was almost all male. In 1955, Xinjiang Uyghur Autonomous Region was established, becoming China's largest provincial region. 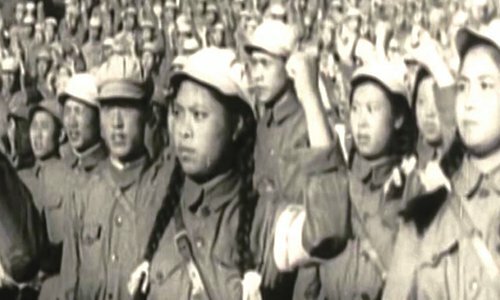 In early 1950s, the Central Committee of the Communist Party of China started to recruit young women soldiers from other parts of China to satisfy the marriage needs of male soldiers, which became a problem that could potentially compromise their stability. It was a decision that also changed the lives of the 20,000 women from Shandong. They worked all kinds of jobs in Xinjiang, and have made great contributions to the construction and stability of the region over the past decades. Many of them stayed and established families there. They were called "the first generation of mothers on the Xinjiang wilderness." Today, 3,780 of them are still alive, and mostly still living in Xinjiang. Their offspring are also taking on significant roles in Xinjiang's development. Their stories were rarely told until recently, after the XPCC, Shandong government and local media started collecting and publishing stories about these veterans. A digital database of their lives is also being built. When Wang joined the army, she was only 16 years old. Previously, she had been a weaver making sacks in Jining, Shandong Province, for four years. One day in 1952, a soldier from Xinjiang came to Wang's hometown and delivered a speech at the People's Square in central Jining, promoting conscription in Xinjiang. "He called on us to go to Xinjiang. He said the tractors were in the fields, waiting for people to drive them," Wang Linying said. At that time, the image of women tractor drivers echoed Mao's slogan of "Women can hold up half the sky," and their colorful posters could be seen around China. Wang dreamed of becoming one of them. "So I volunteered to register, and my family agreed too," she said. In late July, 1952, Wang and 400 other women were sent to Yanzhou, a transportation hub under Jining's administration. A total of 1,300 women had gathered there. They then went west 800 kilometers, to Xi'an, Northwest China's Shaanxi Province, and stayed there for several days before heading to Xinjiang. Nowadays, it only takes four hours by plane, 23 hours by train or 30 hours by car to travel the 2,500 kilometers from Xi'an to Urumqi. But in 1952, it took Wang and her comrades a whole month. "But we were all young people. We were happy," she said. It was sunset when the 50 trucks, each carrying 36 new woman recruits, arrived at Urumqi. The team did not stop there, but drove deeper into Xinjiang. Some trucks would stay on after arriving at certain locations, to drop the women off there. Wang's truck stopped at Shihezi, a small city between the Tianshan Mountains and Junggar Basin, where she joined the 13th company of the eighth cavalry division. She recalled the head of the division being named Wang Jilong. In Shihezi, Wang was first taught to read and write for half a year, before she became a nurse in the division headquarter hospital in the suburbs. "It was very difficult at the beginning. I had to work 12 hours a day," she said "There was no light, so we took barn lanterns at night. There was no tap water, and we washed our hair in the river." "I missed my home. But when I was busy at work, I didn't miss it anymore," she said, adding that the local Uyghurs were very friendly to them as well. In 1959, she married Wang Zuoguo, an engineer at a construction corps from Central China's Hubei Province, after being introduced through a matchmaker. In 1971, the couple moved to a farm in Xinjiang and then to Urumqi in 1974. Wang Linying worked as a midwife there until her retirement in 1992. "She was very conscientious. She never had any accidents during her decades of work," Wang Zuoguo proudly said of his wife. The couple have three daughters and three granddaughters. Several years ago, they moved into their current apartment. Wang Zuoguo loves to write and has published his own book, discussing the "depression of the dollar." She has been back to her hometown several times in the last few decades. The last time was before the Qingming Festival in 2017 to meet her nephews and their children. "But I don't want to move back anymore," she said. "I am satisfied with my current life. If I had not come to Xinjiang, I might have lived a worse life. I thank the Party and the military for looking after me." When asked whether she sees her roots as being in Shandong or Xinjiang, she said proudly and without hesitation, "I'm an old 'Xinjianger.' Although I wasn't born here, I have lived here much longer than most people." 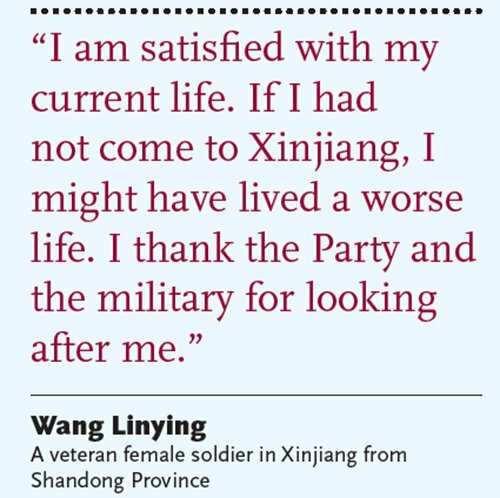 The military life in Xinjiang was not easy for the veterans, but has left them with many precious memories. 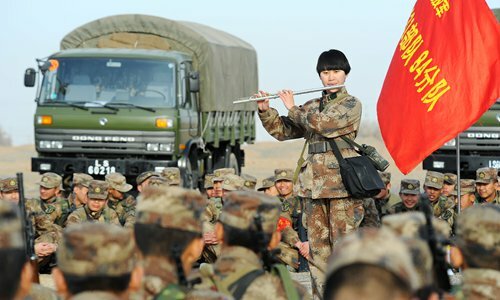 "The happiness I have in my life is all because of the decision to join the PLA and come to Xinjiang," said Ju Xiying, another Shandong women veteran. Ju arrived at Hami in 1952. "In winter, it was a good time to build water channels. Although there were fewer women soldiers, we did everything like men - digging, transferring earth, moving stones…"
Despite working long hours each day without machines, none of them complained. "We were as good as the male soldiers," she said. Xu Shulin was from a small village in Rushan, Shandong Province, where her parents followed the old mindset of favoring their sons. "The food was left for the men, and my sisters and I often had to go hungry." She joined the PLA and came to Aksu in 1952. In 1955, she chose to stay in Xinjiang and worked at Moyu Farm, where she worked the fields and built water conservancy projects. Xu was a hard worker, and could do twice as much work as anyone else, making her a "heroine" in her battalion. She also met the love of her life, Liu Haiping, in Xinjiang. "The land of Xinjiang has given me glory and happiness. I will stay here forever," she said. On January 22, representatives and officials from the XPCC and Shandong government visited veterans to express their respect, bringing Shandong style souvenirs. "They only asked that the people in their hometown did not forget them," Wang Ziqiang, an official from the Organization Department of the CPC Shandong Provincial Committee and Shandong Support to Xinjiang Corps, told the Global Times. 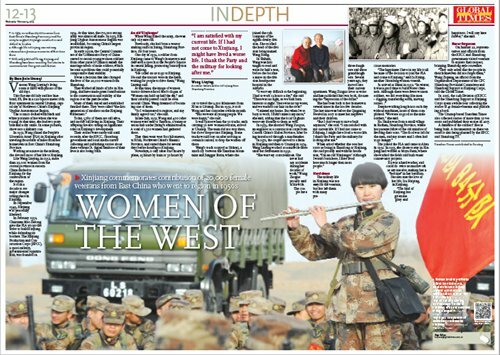 In 2016, the 12th Division of XPCC and the Shandong Support to Xinjiang Corps spent a whole year collecting the stories of 41 female veterans and publishing a book. The Urumqi-based Tianshan Times also collected stories of more than 30 veterans and published their stories in 2017. A database of the soldiers' files is being built. A documentary on these veterans is also being planned by the XPCC and Shandong TV.